 Log In needed DEILCRAFT ROLLING WOOD CABINET - on hold - do not contact! Attention furniture refinishers & hobbyists! 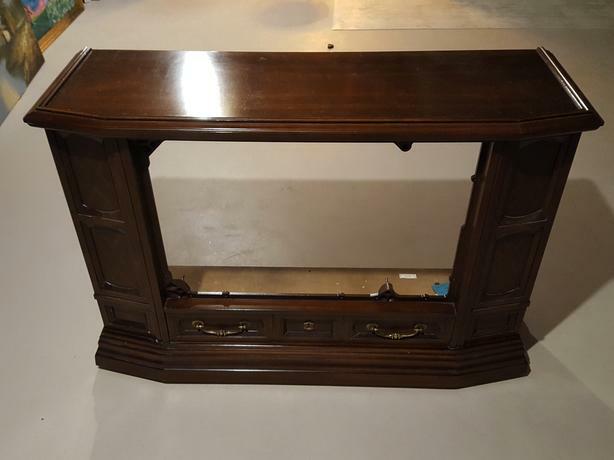 This is a once-gorgeous wooden cabinet by Dielcraft; it used to hold a 26" Electrohome tube TV. It was special-ordered by me from a local dealer in 1982. I removed the TV but kept the cabinet, intending to add a piece of wood to fill the opening and use it as a console table against a wall. This never happened, so I'm giving the cabinet away now. The cabinet has beautiful detailing such shading on the front surrounds and 6-sided top & skirt (see photos). It's on rollers and will move easily on carpet. It measures approx. 46" long x 16 1/4" deep and 31" high.